Middle-aged, fat and frumpy: Just how good can something with only 70 calories be? Just how good can something with only 70 calories be? So I lost one and a half pounds. Better than nothing - and better than Husband - but still. One woman who joined the same time as me has lost ten and a half pounds in the same period. Just saying. 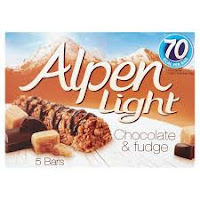 Regardless I am treating myself tonight with a 70 calorie/3 syn Alpen Light fudge and caramel bar, which I suspect sounds better than it will taste.